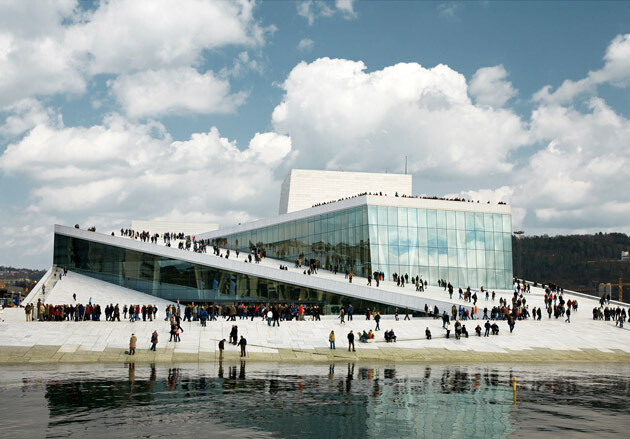 For years, architects have gone to great lengths to protect their buildings from marauding skaters. But as aesthetic trends move toward folded planes that transition seamlessly from wall to ceiling and back to wall, designers have been looking to their former adversaries for a lesson in flow. "We have this fascination with buildings becoming topography," says Alejandro Zaera-Polo, a partner at London's Foreign Office Architects, "and skateboarders have that physical experience." So for a park in Barcelona, his firm extended paving stones up the sides of small hills—to shield vegetation from salty sea breezes. At least that's what it told city officials. But skaters got the message. The resulting quarter-pipe landed on the March 2006 cover of Transworld Skateboarding . 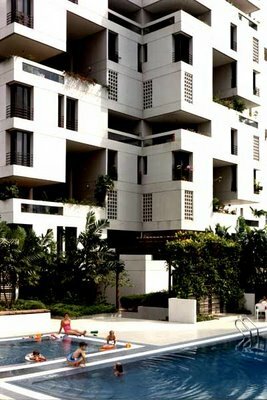 Ce post surtout parce que je trouve cette phrase d'Alejandro Zaera-Polo (Foreign Office Architects) intéressante et intrigante: "we have this fascination for architecture becoming topography" (à quoi j'ajouterais "becoming geography") et aussi évidemment parce que j'aime la lecture urbaine faite de détournements des skater... La réalisation de Snohetta pour l'opéra d'Oslo a également des aspects forts (à l'exception des vitrages) qui rejoignent ce que dit Zaera-Polo: à la façon d'une banquise. A noter que Snohetta ont collaborés avec Olafur Eliasson sur plusieurs projets, dont celui de pavillon pour la Serpentine Gallery de Londres. Recently, the Beijing Municipal Construction Committee, the Beijing Municipal Commission of Urban Planning, and the Beijing Municipal Commission for Reform and Development have called for strengthening management on indoor temperature in Beijing's public buildings. The indoor temperature in all public buildings that are using air conditioning systems or equipment for cooling or heating must not be lower than 26 ℃ during summer and must not be higher than 20℃ during winter. These limits do not apply to public buildings such as hospitals or special enterprises that have specific requirements on indoor temperatures due to production technologies. Vers un cadastre de l'"artificialisation" (air conditionné, lumière, chauffage -eau & air-, consommation d'énergie, etc.)? A few weeks ago I was at a client meeting for the residential project I am currently working on and the conversation aimlessly wandered over to discuss the possibility that future residents might desire to construct various appendages and outcroppings on the exterior of our yet-to-be-realized building. 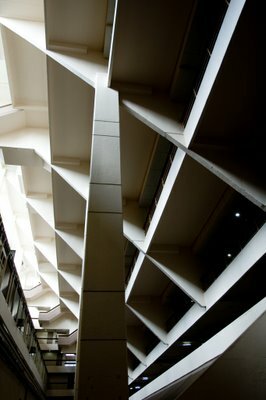 The topic was generally met with a large amount of eye-rolling and grumbling and a discussion on whether or not we can avoid it and if not what strategies we can take to mitigate the potential damage this uncouth display of individuality and customization might reek upon our great edifice. The landscape architect wanted to make an equally damaging comparison so he said something to the effect of “if you let them do whatever you want it will end up looking like the Golden Mile complex—this slanting 60s behemoth where everyone built their own structure on the outside—it looks like a shanty town!” At this everyone simultaneously shuddered and silently exclaimed “NO! Not the Golden Mile!” Everyone that is, except me. I thought it sounded cool and I couldn’t wait to get to my desk and do a flickr search. What I found, well, did not exactly live up to my expectation. I had expected something truly amazing from the description and everyone’s reaction. Something more akin to the favela’s of Sao Paolo. But it wasn’t so bad. Maybe this has something to do with Singapore and their low tolerance for unruliness. More than anything, it revealed to me that maybe architects aren’t as ready for bottom up design as I had thought Golden Mile Complex - Singapore - via Jonolist on flickr Golden Mile is representative of that class of building demonized a few decades ago but quickly gaining wide acceptance once again—the Megastructure. Few megastructures were ever actually built. Singapore might be home to half of all the specimens we can still examine. Safdie built a megastructure in Singapore. 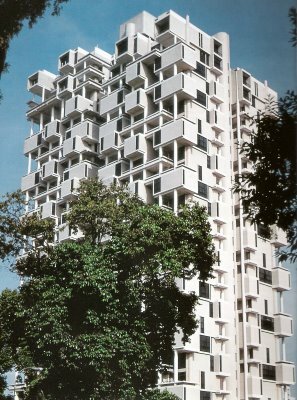 Paul Rudolph did too. Even today we can think of Singapore as a safe haven for the megastructural thinkers of the world. 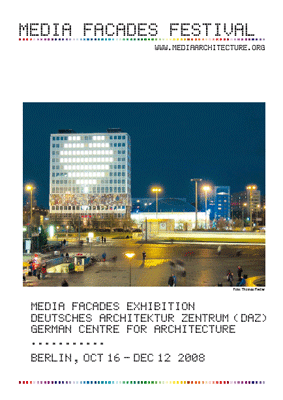 Megastructures went so quickly out of fashion that as early as 1976 Banham was able to subtitle his historical opus on the subject “Urban Futures of the Recent Past” and refer to them throughout the book in the past tense. The Golden Mile complex was finished in 1973 so it barely made it in time. But its existence is currently under threat. 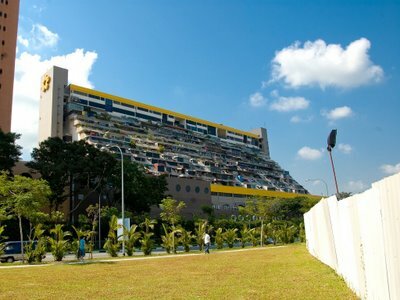 It is slated to be demolished and redeveloped, and a Singaporean politician recently claimed that it is a ‘vertical slum’, a ‘terrible eyesore’, and a ‘national disgrace.’ Who knew that a perfect example of self-expression and democratic freedom epitomized in built form would be so vilified? Point 4 :: a structural framework expected to have a useful life much longer than that of the smaller units which it might support. 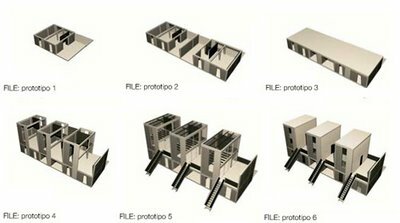 The structural framework can be seen as the top-down approach where as the infill can be thought of as the bottom-up approach—something that can change over time, take on a will of its own, and transcend the designer’s original conceptions. Today designers love to talk about ideas such as bottom up, self-organized, open source, etc. But are we really ready for that? It seems that we are only willing to accept these ideas if they are set into motion by evolutionary algorithms composed by ourselves that we can willfully manipulate to generate an acceptable outcome it the computer. But we might not be so keen to allow an evolutionary process to take place on its own, in real time, completely out of our control. I think many of us are worried that the buildings we design will take on a life of their own and lose that picture perfect image that we see in our minds. This conflicting view is portrayed very vividly in an interview with Siza in the recent Croquis (I should preface this by saying I’m a big fan of his). 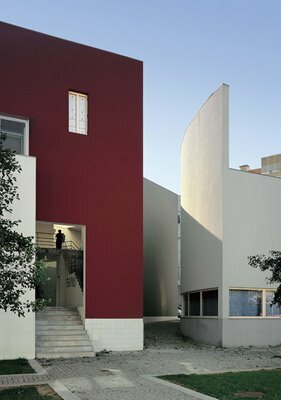 At one point in the interview Siza claims that he prefers for his buildings to transform over time, that “things are really always unfinished. There is never anything that you can say is really concluded…I regard every completed building as a first stone: the rest has to be done by history…starting with the first inhabitant.” Later he (perhaps unwittingly) contradicts himself when discussing the restoration of his social housing in Bouca: “…the cooperative members did not want to negotiate the restoration of certain elements to their original state, like the open terraces which were completely changed with new colours that detracted from the original project. I tried, but it was impossible, so I had to design new glazed enclosures to cover the terraces.” His respectful approach to the restoration of historical buildings (he says that “‘nothing is more beautiful than the ruins of beauty.’ That is why the scar of history is to a certain extent enriching”) he has trouble extending to the restoration of his own buildings. There are some designers who are accepting of change. Some friends of mine reminded me over the weekend of Alejandro Aravena’s Elemental project which has a few resonances with the concepts of megastructures ( structure + infill) but implemented on a much more modest, and some would claim humane, scale. His housing project not only permits change but encourages and enables it. 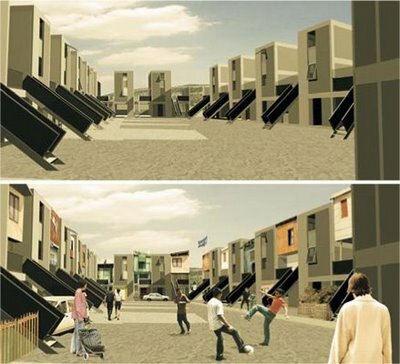 Knowing that typically people who live in squatter settlements tend to build their homes opportunistically—upgrading and expanding the structure as their income allows it—Aravena’s project anticipates the future alterations by designing a flexible spatial and structural framework that accommodates expansion. How can we inherit perennially the judgment of the city? That is, how can we predict today, now many generations in the future will be happily living in this situation as we are today?...I don’t think the architect should create permanent memorials, whether for himself or for history. The architects should always think wisely…Here I think we should apply our agricultural wisdom to our high-rises buildings; they can be harvested time and again like wheat.